The new home market is changing as builders are answering buyer demand. These changes include the construction of homes priced for first-time buyers. So what exactly is going on? As Haro described in his recent real estate market update, demand for homes is high, while inventory of homes on the market is actually down. It’s a great market for sellers, but that supply-demand dynamic means buyers are now competing in bidding wars to secure the homes they want. Home builders are helping to balance the equation a little by adding new homes into the market. Contracts between buyers and builders for new/custom construction went up a full 25% between February 2014 (432,000 new home contracts sold) and February 2015 (539,000 new home contracts sold). And just between the months of January and February of this year, these sales increased 7.8%. The South has seen the greatest number of new homes sold (316,000 in Feburary), followed by the western United States (126,000). The bidding war on existing homes can make contracting a builder to create a new homes a competitive option. 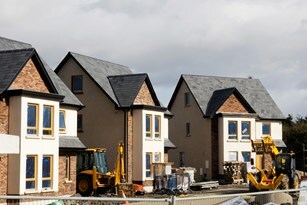 And builders are responding to the market demand by building homes that are more affordable for first-time buyers. The median price of a new home was $294,000 in January 2015, but by February that had dropped to $275,000. If you’re thinking about having a new home constructed, contact someone at The Haro Group and we’ll get you started on the first steps!